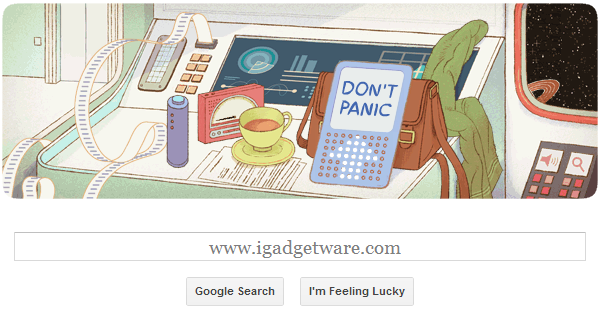 Today Google Doodle Celebrates 61 Birthday Of Douglas Adams. Douglas Noel Adams born on 11 March 1952 and died on 11 May 2001 after heart attack. Doodle is animated which displays a cup of tea, radio, a bag, towel and on the left there is a door when we click on it then then one robot displays. Adams was an English writer, humorist and dramatist. He is best known as the author of The Hitchhiker's Guide to the Galaxy, which started life in 1978 as a BBC radio comedy before developing into a "trilogy" of five books that sold over 15 million copies in his lifetime, a television series, several stage plays, comics, a computer game, and in 2005 a feature film. Adams's contribution to UK radio is commemorated in The Radio Academy's Hall of Fame. Douglas Adams created an interactive fiction version of HHGG with Steve Meretzky from Infocom in 1984. In 1986 he participated in a week-long brainstorming session with the Lucasfilm Games team for the game Labyrinth. Later he was also involved in creating Bureaucracy (also by Infocom, but not based on any book; Adams wrote it as a parody of events in his own life). Adams was also responsible for the computer game Starship Titanic, which was published in 1998 by Simon and Schuster.